So how did I do this? With vegetables like sweet potatoes or yellow potatoes, carrots and onions. A bit of nutritional yeast. And the pasta? Made with chickpeas! Have you heard about Banza? The folks at Banza sent me a box of complimentary pasta to sample and I’m in love! It’s pasta made in Detroit from chickpeas and only three other ingredients. Double the protein, four times the fiber and half the net carbs as “regular” pasta. Plus it is made in a dedicated gluten-free facility. It’s available in shells, rotini, elbows and penne. I’ve tried all four varieties and can’t possibly pick a favorite. The elbows and the rotini both worked well making this mac & cheese recipe. The creamy, cheese sauce for this mac & cheese is made in a high speed blender, such as a Blendtec or a VitaMix. If you don’t have either of those, I’ve added special instructions at the bottom of the recipe. It was hard to sell me on one of the high speed blenders way back when I was training to be a certified living foods chef. But after buying one, I can’t imagine living without one. This sauce cooks, yes cooks, in the blender. It gets steaming hot in the blender in less time than it takes to boil water and cook the pasta. Such an easy weeknight dish! Boil water and cook pasta as per directions on package. Turn blender on low, slowly working speed up to high. Blend on high until sauce is creamy and steaming hot. Drain pasta. Gently mix in about half of the cheese sauce. You will not need the entire batch of cheese sauce, only about half. Serve immediately. The remaining cheese sauce may be stored in the refrigerator or frozen. I have frozen this sauce and allowed it to thaw at room temperature with great success. If you do not have a high speed blender, you will need to boil water in a medium saucepan. Add the vegetables and cook until fork tender. Transfer to regular blender with all other ingredients except the vegetable stock. You will eliminate the vegetable stock and instead replace it with hot cooking liquid from the vegetables. 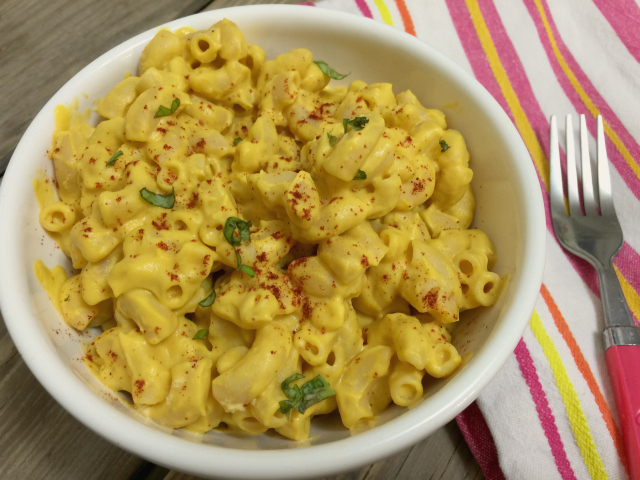 Big thanks to Vegan Yumminess and Veg News magazine for their inspiration in creating this recipe, which is an adaptation and modification combining elements of both of their recipes as well as my own take on mac & cheese. Boil pasta per directions. Drain. 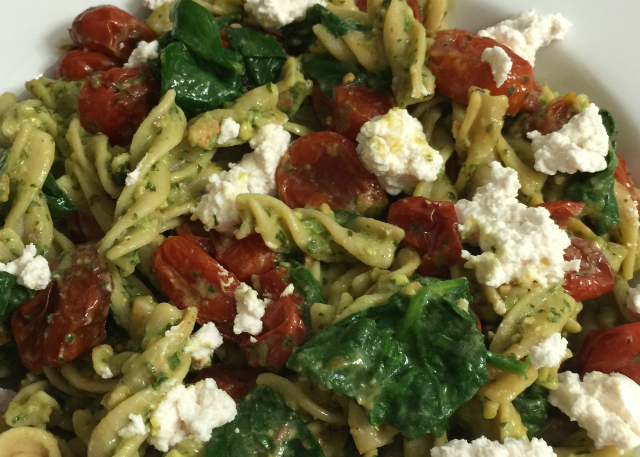 Return pasta to pan and toss with spinach. The spinach will wilt. Start to mix in Magic Green Sauce, a couple tablespoons at a time until the pasta is nicely coated. Stir in roasted tomatoes. Split into bowls for serving, top with crumbles of Kite Hill ricotta. You’ll have Magic Green Sauce left over. I’m obsessed with it, thanks for my friend Sarah from Celiac in the City. It’s great on roasted vegetables, excellent as a dip with raw veggies, perfect as a baked potato topping, fantastic brushed on grilled tofu. Let me know how you enjoy it! Disclosure: As mentioned earlier in the post, the nice folks at Banza sent a few boxes of their pasta to me. 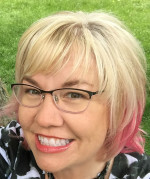 No other compensation was received and I was not asked to write about their product. Every box they sent was quickly gobbled up and we’ve purchased more at our local Sprouts store. I’m sharing my opinion only, not sponsored content. « Support a Gluten-Free Farm AND Trust Your Oats! Wow, Johnna, your new Mac ‘n Cheese looks and sounds exceptional! The bonus recipe looks divine, too. How terrific that this grain-free pasta is so delicious! And that it comes from Detroit, which needs more good news stories. 🙂 I really want to try this pasta and your recipe, Johnna. I hope you will give it a try! And you are right, Detroit needs all the good news stories. So many wonderful things happening there! Whoa. I’ve been *patiently* waiting for this recipe to show up here, THANK YOU! I have a hard time with the taste of chickpea flour, but may have to try these noodles anyway. 😉 And the bonus pasta recipe is so simple and anything with that magic green sauce and I’m in! Brilliant! I love the idea of blending veggies in the sauce. We are totally making this. Have blender and pot? Even I can make this in my baby kitchen! Yay! Can’t wait to hear what you think. I live in Ontario Canada. Do you know if GF Harvest ships or markets their GF protocol oats in Canada? Love Banza pasta! This is such a creative recipe! I really can’t wait to try it! I love Banza, too! I hope you’ll give this recipe a try. This is interesting…never heard of chick pea pasta! Until I tried Banza, I had not heard of it either. It’s so good, has a nice bite to it and sticks with me unlike some other pastas. Good stuff! I had not tried it until recently either. I am really enjoying it! 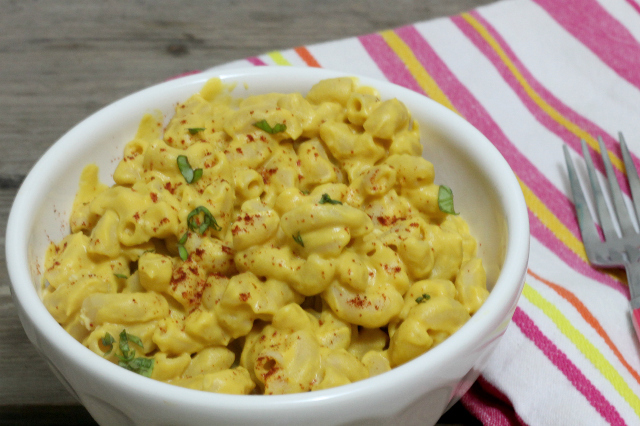 What a great allergy free recipe for mac and cheese! yum! What an interesting recipe! We’re not gluten free but I’m still trying this out! I agree, it is very filling. Not in a heavy, icky, I-just-ate-at-a-buffet way, but in a good way. And I’m not hungry an hour later like I am with rice pasta. I have you to thank for introducing me to this goodness! !